David Fincher is a director with an exceptional interest in exploring the coordinates of modern identity. This trend began in earnest with Fight Club's examination of the destructive effects of consumer culture, and continued through The Social Network's recent depiction of the emotional distancing caused by immersion in mass media. Our current era is in the middle of an identity crisis, and the director's newest film Gone Girl plays out like a neo-noir companion piece to The Social Network, with its focus shifted from masculine to feminine identity. 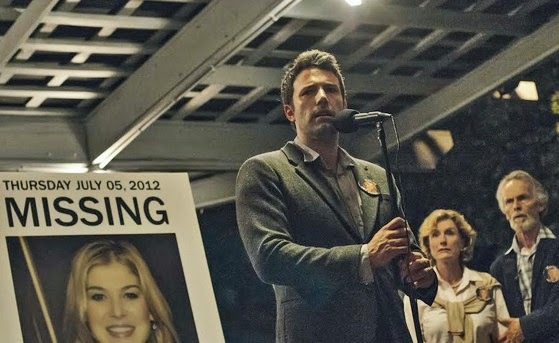 The film opens with a voice over of Nick Dunne (a charmingly passive Ben Affleck) discussing his desire to crack open the head of his wife, Amy Elliot-Dunne (a ravishingly enigmatic Rosamund Pike), so that he might better understand her thoughts. His wife is an impenetrable mystery, and beginning the film on this note foregrounds the unknowability of desire and identity as a central thematic kernel for the film. Amy has gone missing—she wasn't killed, she wasn't abducted, she is simply gone. The ensuing quest to find her plays out with a measured pace and ominous atmosphere which work together to create a consistent feeling of mounting dread. The music from Trent Reznor and Atticus Ross is absolutely stunning, utilizing a distinct mixture of romantic sentimentality and sinister portentousness which shifts and builds along with the story. Cinematographer Jeff Cronenweth paints his photographic compositions with a dark and desaturated brush, and editor Kirk Baxter cuts these paintings together with sharp and jarring precision (both are frequent Fincher collaborators). Alongside Nick's investigation into Amy's disappearance, Gone Girl also tells the story of how the couple first met. Amy writes in her diary about their initial encounter and a variety of other events leading up to her disappearance, and the way these scenes are integrated into the overarching narrative hint at the film's deconstruction of romantic fantasy. In the flashback, the two lovebirds are still deep under each other's spell, but just as the music swells to its tender climax we abruptly cut back to the quiet and mundane details of the ongoing case. Fincher constantly interrupts the passionate melodrama of the situation, thereby undermining the fantasmatic power of their love. Gone Girl is thoroughly—and at times brutally—honest in its portrayal of romance. Fantasy's warm welcome finds itself banished from Fincher's cold world. As the search for Amy continues, we see more of her on posters and billboards than we do of her actual self. Her absence is the film's central concern not only at the narrative level, but thematically as well. It's as if her body has disappeared but her image remains. In a world where identity is increasingly becoming dislocated from the self, Amy is a woman who self has vanished entirely. She has become the signs which call for her return. She is literally a "gone girl," a girl who exists only as nonexistent. The nature of Amy's contradictory character forms the foundation of the film's feminist politics. She sees that all the available options for female identity are structured around male desire: she repeatedly criticizes the "cool girl," who does exclusively what men want her to do. This is the image against which Amy constructs herself. She refuses to give ground relative to her desire. She attempts to wrest feminine identity from the oppression of male-dominated society—a struggle which occasionally turns violent, but which nonetheless never loses sight of its purpose. She is an intensely principled antihero in spite of her cruel ferocity, and as a result is one of the most impressively imposing female screen presences in recent memory. And this is exactly why Nick wants to crack open her head and examine her thoughts. This desire to look inside someone, to be able to see past external appearances, is almost as pervasive a presence in the film as Amy's conspicuous absence. Characters constantly recite clichés and half quotes, constructing their identity out of the fragmentary remains of others. As David Fincher puts it, "we create a facade, a narcissistic projection of our better self" to show to other people. But this creation is always false, derivative; a construction of the self from the other. Nick is particularly problematic in this regard. He has hidden himself so far beneath the surface that he must be coached to appear genuine. Part of the magic of Fincher's creation is that there's no clear protagonist. It's noir not only in appearance, but in character. Everyone is corrupt, and just when you think you've figured someone out, another layer is peeled away. 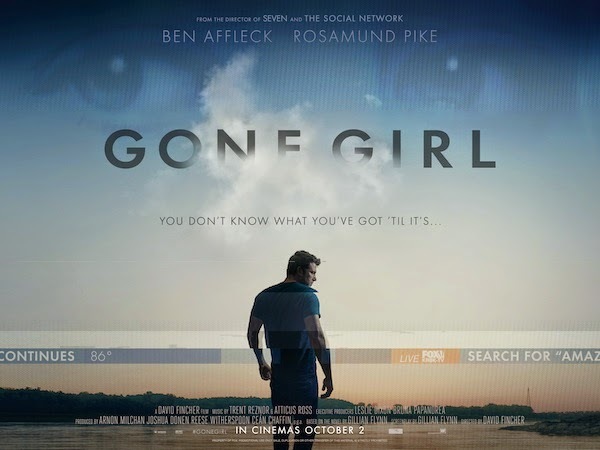 Gone Girl is an exceptional work from an exceptional director, and its haunting portrayal of contemporary identity will stay with you long after you leave the theater. But for all its bone-chilling madness, there a perverse draw which will leave you hungry for more, wanting to return to crack open and unspool the film, looking for answers.